I would really like to know what brought you to my website. So, PLEEEEZE, make a note in my guest book down below. If nothing else, just your first name and what brought you here. Thanks. As you will probably see, my site is dedicated to wood carvings. I mainly carve angels. 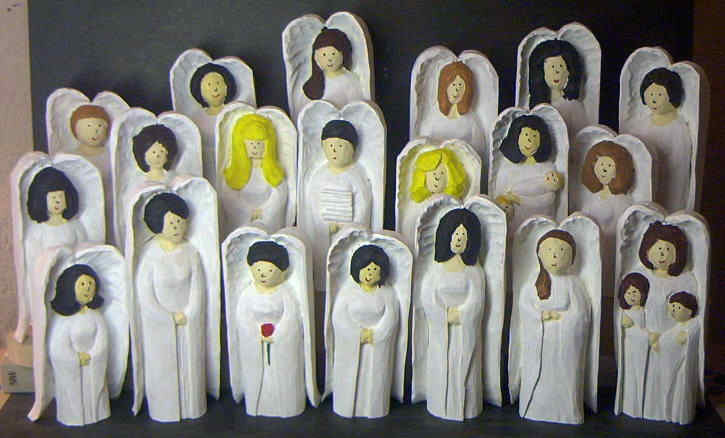 You will find pages of angels that I have carved as well as carvings in process and their inspiration. You will also find a few santa carvings and even a faerie. Enjoy my pages. Use them for inspiration in your own carvings, or if you see something that you like, send me a note at the address below. 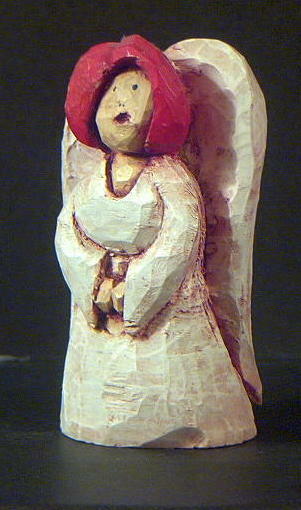 This angel to the right was the first angel that I carved. I carved her first because she is my very own angel for the last 18 years. My wife, Jan.
Angel Page 2 More Angels. Angels Under Construction Some of the angels that I am currently carving. More Angels Under Construction. These are some of the CCS angels while I was working on them. The BIG PROJECT IS DONE, finally!!! The Angels of CCS. Pictures of the Angels of the California Childrens Services Sonoma Medical Therapy Unit, in Modesto, CA are finally posted. (Took me long enough! )Now there are two more to carve. MOO Brace I realize that this is off the subject of wood carving, but this is what I do during my day so that I can make money, feed my family and buy wood. The Blue Faerie She is only just completed, but she is beginning to enchant me already. Woggle World. Where the boys scouts and woodcarving come together. NOTE: This section is still under construction and some of the pages are incomplete. Who are the angels? Click here to see what I believe about angels. What about me? Some things about me and my family. Do you want wings? What it takes to get a carving of yourself. Philosophy...these essays are in progress and may not be complete. Notice: Construction of this site was begun on 02/04/01 and was last updated on 02/20/02.